As I find myself approaching the tender age of 25 and with the prospect of passing the 10-year anniversary of becoming a fully-fledged, official Metalhead (26th May 2001 - seeing Black Sabbath at Ozzfest) looming large, it is with a mixture of both pride and trepidation I have started to view myself as an elder statesman of metal in these here parts. 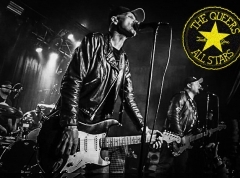 The end of my pitting days many moons ago was a pre-cursor, the current age of cynicism now undeniable, but freshly added to that list is feeling aged at concerts against the majority of those around me. Children of Bodom, Amon Amarth & Ensiferum helped bring about reason number three, not least when I can count a previous 18 previous live experiences with this triumvirate of Scandinavian monoliths. First act however was one with whom I had no prior experience: Machinae Supremacy of Sweden, a band with sadly far less going for them than the acts to follow. What was presented on stage to a sparsely populated Forum at this point sounded much like the kind of generic nothing-metal many bands devoid of identity fall into; heavy riffs interspersed with clean and screamed vocals yet nay an interesting song to keep the interest levels peaking. Had I known what Metal Archives tells me of the band's liberal usage of computer game sound effects my feelings would have been considerably harsher, but, in the reasonable sound quality we were at least spared the sound of button bashing and whatever else constitutes an influence gleaned from video games these days. Much to my surprise (given I myself had never so much as heard of the band) a relative contingent seem to be enjoying the band with glee, and fair play to them, but besides the satisfactory stage presence and smiling faces I quickly realised why after a decade plus (the band, not me, yet) they still remain an unknown entity. Since it's release at the latter end of 2009 "From Afar" has earned multiple playbacks from yours truly, most especially the double salvo of "From Afar" and "Twilight Tavern", which is just as lucky as no Ensi show I've seen since (and that's a few) has excluded either of these. Proving that throwing a few kilts and a lick of war paint to your stage attire is enough to make your band stand out, no Ensi show is ever dull and despite just 6 songs in length these folk-loving Finns comfortably got the crowd going with their multiple singsongs, not excluding a happy birthday chant to lovely keyboardist Emmi Silvennoinen for her 23rd (bloody young 'un) birthday. It's easy to understand why my sentiments aren't quite as strong as for their performances in the more exotic surroundings of Metal Camp and, ahem, Bloodstock, last year, but accept my continued recommendation of Ensiferum as an act worthy of attendance any day of the year. Amon Amarth, my most witnessed live act (now 11 times) and still a firm favourite. 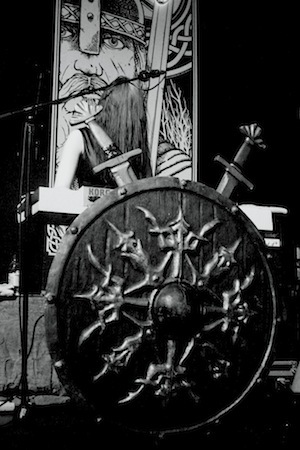 It's hard to believe around the time of "Fate of Norns" and "With Oden On Our Side" AA appeared to be running out of ideas such has been their recording strength since then, but the live arena is one ground where they have never pulled up short. The formula hasn't changed, and why should it? Who knew five burly, intensely Scandinavian-looking guys, blasting catchy death metal sung entirely about Viking mythology could have such lasting appeal? 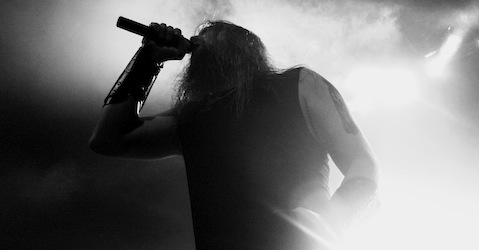 Modern day Viking hero Johan Hegg is nowadays an impeccable frontman, whilst his cohorts made the most of the distinct clear sound on offer to pillage their way through 9 songs taken exclusively from their last 3 records with the kind of setlist that one always expected when playing on such a bill. Being years into a passionate relationship with the likes of "Once Sent From The Golden Hall" and "The Crusher" inevitably led to disappointment for myself and those with a yearning for the bands' older, heavier material, but witnessing the prowess of their newer tunes only confirms why AA are today one of the biggest metal bands on the planet. For as long as AA play near me I still see no reason to not return for live experience number 12. In contrast to the unstoppable rise of Amon Amarth, Bodom's recent career has been driven across a much rockier road with everything since Hate Crew Deathroll (even which had it's detractors) in 2003 acclaiming little critical glorification. Of course though recording quality can often be inversely proportional to fan acclaim and here in 2011 Bodom still remain a top drawer act, thankfully performing a set more diversely culled from their 7-album discography than AA managed before them. The tracks taken from brand new "Relentless Reckless Forever" (including "Not My Funeral" and "Shovel Knockout") have their moments but in the likes of "Children of Bodom", "Follow the Reaper" and "Downfall" the Finns found a truly unique way of combining classical flourishes with scything metal riffs that remains especially potent today. Gauging opinion of CoB's performance of all these is always subject to the mood the band appear to be in - there is a fair accusation of them playing-by-the-numbers - however letting go and getting caught in the maelstrom of obscenities and posing of one Alexi Laiho still remains the better option on offer. Needless to say, a Bodom show has not quite followed that downward curve their recorded output has headed as otherwise you might have seen me heading out half-way through; let's hope the former can inspire the latter to truly return them to the glory days of old. Photos courtesy of Nikki Ryan. To see the rest from the night check out her Flickr page.